Michael McFadyen's Scuba Diving - Bubble Cave One of the most popular dive site names (together with "The Arch") would have to be The Bubble Cave. I know of at least three (at North Solitary Island, at Montague Island and here at Batemans Bay) but I am there are more even in NSW. (There are at least four dive sites called "The Arch" in NSW - Jervis Bay, Shellharbour, Broughton Island and Batemans Bay). This Bubble Cave is located on the north-western corner of Black Rock which is located just off the southern side of Batemans Bay. Batemans Bay is about three and a half hours south of Sydney and makes for an easy weekend dive trip. 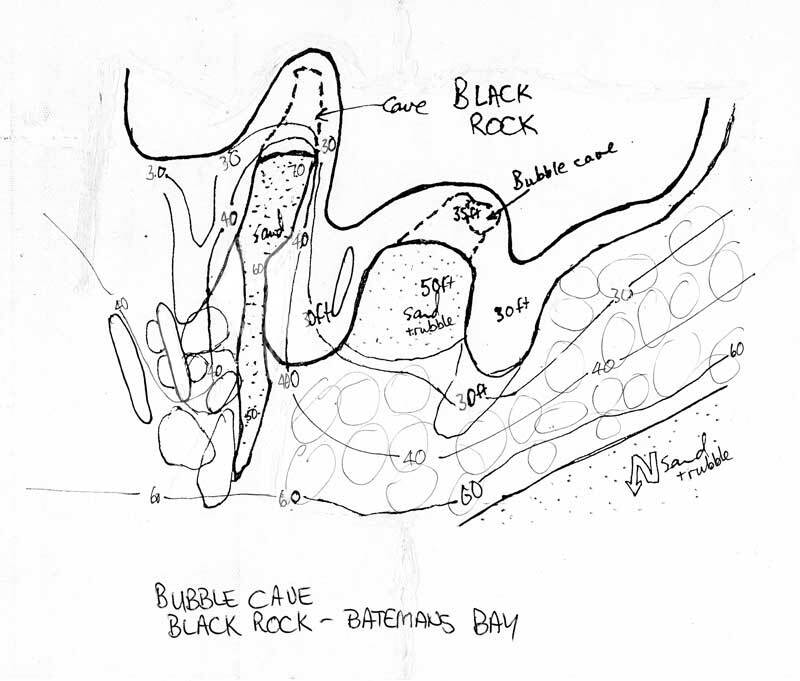 One of the great dive sites around Black Rock is the Bubble Cave. Anchoring off the north-western corner of the rock, the sea floor is about 15 to 18 metres, depending how close you are to the rock. The floor here consists of rocks and boulders. As you swim to the south-east and closer to the island, the depth comes up to nine metres or less. Follow the wall to the left and you will come to a "point'. You can either go over the ridge or swim around. You will encounter sand and rubble in front of you, an amphitheatre-like formation at a depth of 15 metres. This is straight off the Bubble Cave. Swim to the back of the sandy bottom and you will see the Bubble Cave. It is quite large, big enough for three or four divers to stick their heads out of the water for a chat (the depth here is about 13 metres). Once, a few years back, two very keen divers even got married while in the Bubble Cave. After exiting from the cave, swim back to the north over the sand rubble. On your right there is another ridge which you can either swim around or over. Below there is a sandy gutter that runs for 30 or 40 metres in almost a north/south direction. Follow the gutter to the south and the depth increases to 21 metres before coming to a sudden end. There is a long, large cave here that runs right back into Black Rock. After examining this cave, follow the gutter to the north till it narrows and eventually peters out altogether. From here, swim back to the west, keeping at whatever depth you want. Once again, the fishlife is good but the terrain is waht makes this dive special. Only a couple of minutes run from the boat ramp, caves and gutters make the dive.